Fresh off a multi-million dollar exterior renovation, Aston at the Whaler on Kaanapali Beach invites guests to rediscover perfection at this exclusive, luxury condominium resort with a prime location on Ka`anapali Beach. Each spacious suite includes a fully-equipped kitchen and private lanai with spectacular views. The beautiful garden courtyard features a soothing koi pond, waterfall and oceanfront pool complete with jet spa and cabanas. World-class shopping, dining and golf are just steps away. On Kaanapali Beach, next to Whalers Village Shopping Center. 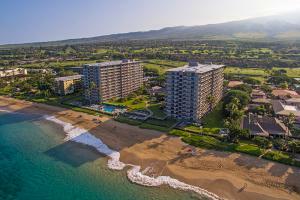 Approximately 45 minutes from Kahului Airport and 10 minutes from West Maui Airport.